An immersive annual showcase and dialogue for art and film is set to take place at the Six Senses Yao Noi, Beyond Phuket from December 16 to 20, 2011. Film on the Rocks will be a 4 days and 3 nights of film showcase, local activities and conversation. Dictated by nature, the screenings will be informed by the tides, the activities will embrace Yao Noi and her neighbouring islands, whilst conversation will stem from interaction with locals. 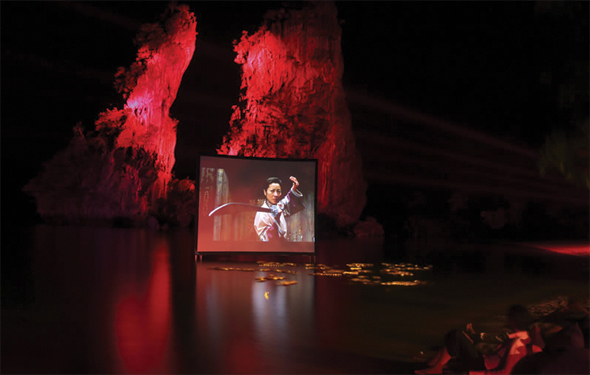 Tilda Swinton, Cultural Activist and Producer and Apichatpong Weerasethakul, Filmmaker and Winner of the 2010 Palme d’Or will curate the inaugural Film on the Rocks. Ms. Swinton and Mr. Weerasethakul will present film titles to be screened on the rocks of Phang Nga Bay, under the stars. This year, emerging filmmakers will be chosen by Mr. Weerasethakul and their works will be premiered at Film on the Rocks. The premiere event, Film on the Rocks will be 4 days and 3 nights of film showcase, local activities and conversation. Fully dictated by nature, the screenings will depend on the tides, and the wide array of activities all aims to embrace Yao Noi and her neighbouring islands. Local activities, debates and conversations will take place with the participation of Waris Ahluwalia, Jefferson Hack, Andre Saraiva, Olympia Le Tan and other personalities together with local villagers and the sea gypsies of Yao Noi. In addition, Film on the Rocks will be hosting residencies each year at Six Senses Yao Noi. This year, the emerging filmmakers will be chosen by Mr. Weerasethakul and their works will be premiered at Film on the Rocks. The event aspires to be an alternative platform upon to showcase views where different worlds converge, to start a dialogue with not only each other, but also the environment and the world. It proposes to do so by bringing luminaries together to Yao Noi, an island detached from common big city concerns to reflect upon the notion of shared experiences. This will be the first event of its kind taking place at Six Senses Yao Noi. Yao Noi sits at the centre of some of the most magical locations and iconic sites in cinema history. Film on the Rocks aims to be a source of creativity and not just a backdrop to these moments. Six Senses has pioneered the idea of intelligent luxury and environmentally sustainable eco-tourism. It also continues to support cultural exchanges on its properties worldwide.